I was craving Pad See Ew so bad I felt like I was about to throw a tantrum on the floor like my three-year-old does if I didn’t eat it today. But I didn’t have rice noodles, and I didn’t have chinese broccoli, two important ingredients for authentic Pad See Ew, Thai Soy Sauce Noodles. I also didn’t have time to go buy them at the Asian market and make the 1-hour round trip drive between naps with both my toddlers. But I scrounged around in my pantry and discovered I did have Barilla Protein Plus angel hair pasta (my weight-lifting hubby’s favorite noodles) and fresh spinach, chicken, garlic, eggs, and all the Thai sauces that go in Pad See Ew. So I decided to make Pad Se Ew anyways, even though it wasn’t going to taste like from a street vendor Pad See Ew. If you ever feel like you shouldn’t make a Thai dish you are craving because you don’t have all the authentic ingredients to make it, make it anyways. Take what you have in your fridge and pantry, and see what you can make that will fill you up with love and nourishment. If it doesn’t taste like a Thai grandma made it, the Thai Food Legit Police wont come and arrest you, or I would have been in jail long ago. 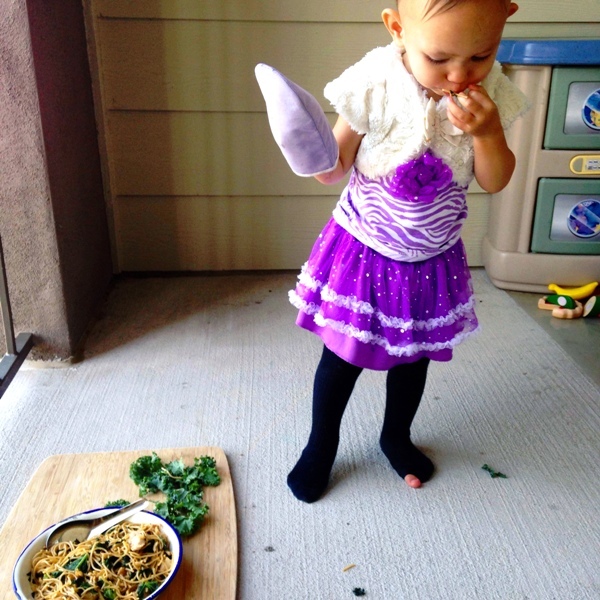 Just enjoy the process of making Thai food, and no matter how it tastes, this is my favorite result of any meal: my toddler daughter sneaking in to take a bite during my pad see ew photo shoot cuz it looked so good she couldn’t resist! 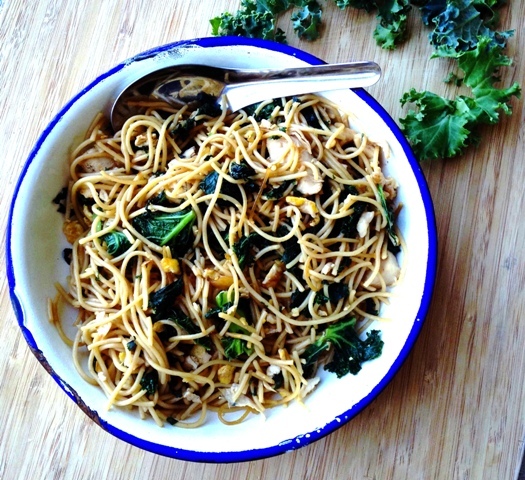 Need a quick Thai noodle dish with items in your pantry? 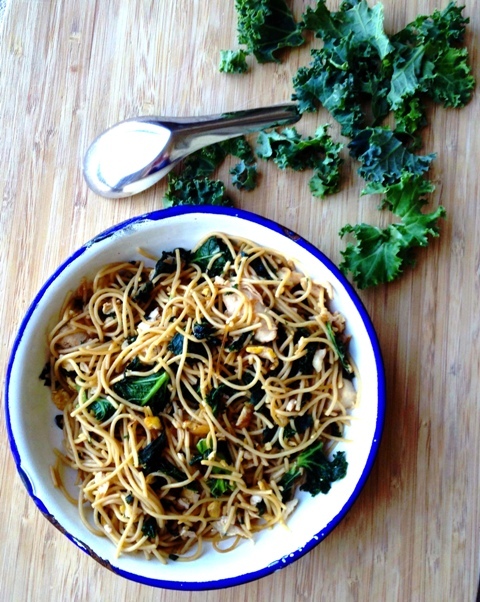 Try this easy take on Pad See Ew, Thai soy sauce spaghetti noodles with chicken! While noodles cook, add 1 tbsp. oil to a pan set on medium-high heat. Scramble the eggs and cook until set. Take out the eggs and place on a plate. Add more oil if needed, then add garlic. Stir the garlic until fragrant, and add the chicken. I like to add a little of each sauce at this point to the chicken. Stir-fry until chicken is no longer pink. 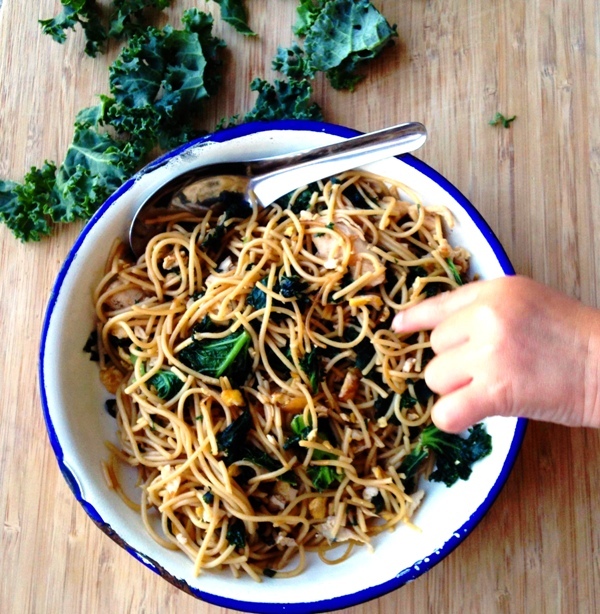 Turn off the heat and add the cooked eggs, sauces, sugar, noodles and spinach. Mix and add more sauces to taste. I like this dish to taste savory with a sweet hint. Sprinkle white pepper on each serving to taste. If you like, you can also add Thai Sriracha to your pad see ew like they do in my Thai hubby's hometown Sukhothai.